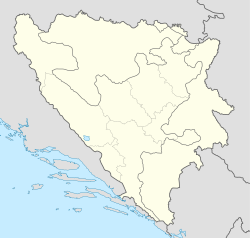 Location of Čelić within Bosnia and Herzegovina. Čelić is a town and municipality located in Tuzla Canton of the Federation of Bosnia and Herzegovina, an entity of Bosnia and Herzegovina. Čelić was part of the municipality of Lopare prior to the war in Bosnia and Herzegovina. The part of the municipality that was controlled by the Army of the Republic of Bosnia and Herzegovina became the municipality of Čelić. The municipality is 132 km2 (51 sq mi) with a population of 12,000. It is located in the hills of Majevica. Čelić borders the municipalities of Srebrenik, Tuzla, Lopare (RS) and the Brčko District. According to the 2013 census results, the municipality of Čelić has 12,083 inhabitants. Wikimedia Commons has media related to Čelić. This page was last edited on 20 May 2018, at 14:25 (UTC).